While you do not command a headquarters mission, you may play this ship at Caretaker’s Array. While this ship is at a mission, you may play Treachery personnel, personnel, and equipment aboard this ship. While you do not command U.S.S. 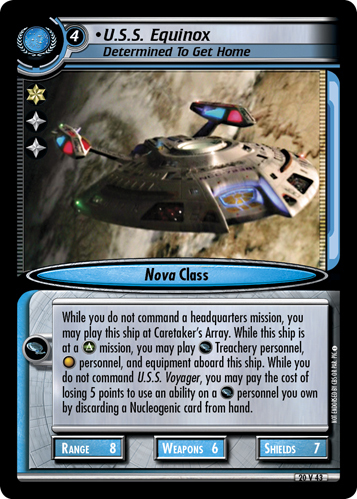 Voyager, you may pay the cost of losing 5 points to use an ability on a personnel you own by discarding a Nucleogenic card from hand. Characteristics: affiliation, Voyager related, discard a specific card from hand. Requires: "affiliation", Voyager related, Nucleogenic, Delta-Quadrant mission, headquarters. This card has an erratum: Clarification on special skill.